Over the years, OnePlus has earned a reputation of offering ‘more for less' and this philosophy continues till today. 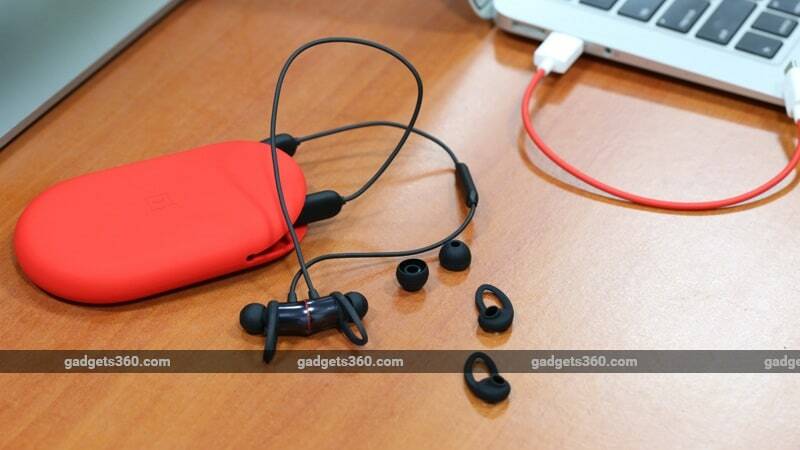 Alongside the launch of its newest flagship smartphone, the OnePlus 6 (Review), the company also unveiled its very first pair of wireless earphones called the Bullets Wireless. 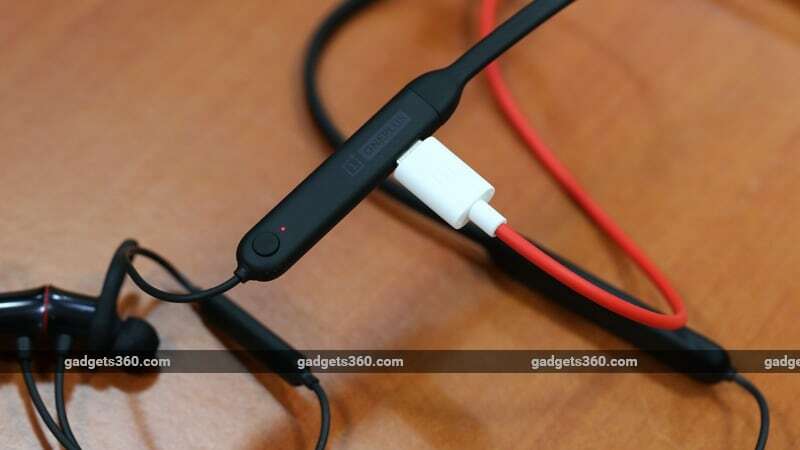 The wired OnePlus Bullets V2 earphones have been hugely popular and have been rated highly by us too, for its value for money and good performance. With the 3.5mm headphone socket slowly disappearing from smartphones, it only made sense for the company to dabble with a wireless option too. The Bullets Wireless earphone is priced at Rs. 3,990 and boasts of features like fast charging, eight hours of claimed battery life, and Qualcomm's aptX high resolution audio codec support. We've been testing them for a few days and here's what we think. The earphones ship is a simple white box with a drawing of the Bullets Wireless on the cover. Inside, on the right half of the box, there's a little compartment for the extra ear tips, wing tips, and a bright red silicone case below them. There's a short USB Type-C charging cable included in the case too. The earphone itself gets its own intricate packaging, which is a bit of task to unpack. Instruction and warranty leaflets are also bundled here. The neckband-style earphone is light and covered from head to toe in a soft, silicone coating. It feels slick and also makes it resilient to liquids. In fact, the Bullets Wireless is said to be sweat and water resistant even though it doesn't have an official IP rating. On the left side of the neckband, we have an exposed USB Type-C port, a microphone, and a Bluetooth pairing/ power button. We would have liked a flap for the Type-C port for added protection against the elements, however OnePlus confirmed to Gadgets 360 that the port is water resistant too. The chambers for the ear buds are made of aluminium, with a glossy finish and red accents around the edges. The flat back also houses magnets, so the ear buds stick together when they're around your neck. This also automatically pauses your music. You get an in-line remote along the left wire, which lets you control the volume and music playback. Each ear bud of the Bullets Wireless feature a 9.2mm dynamic driver and something called an Energy Tube, which is a special housing for the driver that's said to minimise reverb. 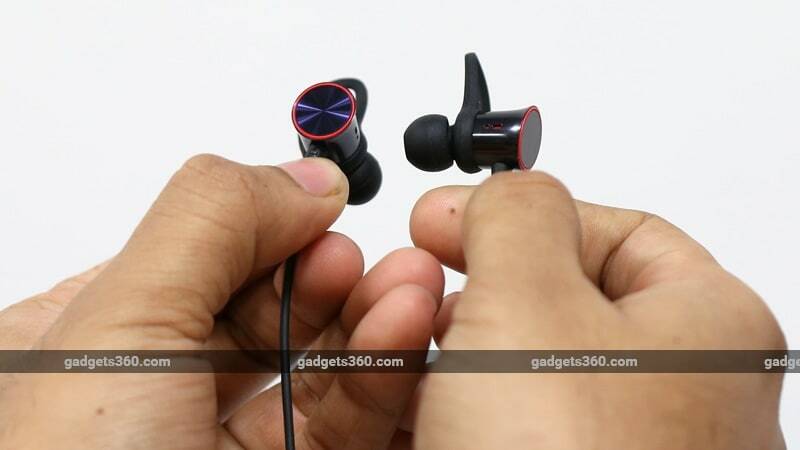 The earphones use Bluetooth 4.1, which has of a range of 10 meters. It also supports Qualcomm's aptX high resolution audio codec and a promise of an eight hour battery life. There's also built-in Dash Charge technology, which is said to deliver around five hours of battery life with a 10 minute charge. The earphone is missing NFC for quick pairing and there's no vibration motor in the neckband to alert you of incoming calls, a feature we've increasingly seen in neckband earphones. We start with a feature that's unique to OnePlus smartphones, which is the magnetic pause and resume. If you head to the Bluetooth section in a OnePlus 6, there's something called ‘Earphone mode'. In this, the Auto Play toggle switch needs to be enabled, after which the earphones will automatically resume paused music when detached. When the earbuds are magnetically joined, it actually breaks the Bluetooth connection and then quickly re-establishes it when you separate them. The magnetic pausing happens on other Android phones and iPhone models too, however, the resume function doesn't work. According to the OnePlus website, this feature works on the OnePlus 5 (Review), OnePlus 5T (Review) and the OnePlus 6 (Review). OnePlus also talks about support for Google Assitant on the Bullets Wireless, but what this actually means is that you can summon the Assitant with a long press of the ‘Play' button on the in-line remote. Similarly, if you have it paired with an iPhone, it will summon Siri. This is something most earphones or headphones that have in-line buttons support anyways. The Bullets Wireless is incredibly comfortable to wear for long durations. The ear buds are light and don't cause much fatigue and the wing tips rest well along the inner ridge of your ear. The fit is snug and even running around doesn't dislodge them from your ears. We wish the silicone case would have been a bit larger or more capacious as you really have to stuff the earphones in, especially if you're also carrying around the USB cable. The earphones can only have a single active connection at a time. There's no voice prompt to guide you through the pairing process, instead, you get a series of audible beeps for this or you could go by the status of the power LED on the neckband. When connecting to a OnePlus 6, the phone shows you a little card with the image of the earphones, which you can tap on to finish the pairing process. When you connect to an Android Oreo smartphone, the streaming codec defaults to aptX. For the iPhone, you're limited to SBC as the Bullets Wireless don't seem to support AAC. The latter is also one of the reasons why the earphones sound slightly better with an Android phone. On the iPhone like the 6s Plus and 7 Plus (Review) that we used, the Bullets Wireless sounds a little bright as the treble takes centre stage and this is only amplified as you push the volume higher. There's good instrument separation and vocals are crisp, however the bass is a bit soft so you don't really feel the thump in most tracks. Listening to Hall of Fame by The Script streamed through Apple Music on an iPhone sounds quite shrill at high volumes. On Android with aptX, the Bullets Wireless showcase a sightly wider soundstage, with more pronounced bass while still maintaining good instrument separation and crisp vocals. We tested it with a OnePlus 6 and a Samsung Galaxy S9+ (Review). The highs are still a little bright but it's not that sharp. Tracks like Yellow Light by Pharrell Williams have better definition with higher emphasis on the lower frequencies. We didn't notice any distortion in bass even at full volume though with most tracks, we found the 80 percent level to be more than adequate. The silicone ear tips offer good passive isolation from ambient noise and we didn't have any issues with voice calls either. The caller on the other end was able to hear us pretty clearly even when talking outdoors. The earphones leak a bit of sound, which is noticeable in a quiet room but not so much where the person next to you can make out what song is playing. The Bullets Wireless is rated to deliver eight hours of playback time, which we found very achievable. During our usage, we easily managed to hit this mark and at times, managed to squeeze out a bit more too. But what's really cool is the ability to fast charge the earphones. When connected to a USB port of a MacBook Air, the Bullets Wireless managed to charge up to 80 percent from zero (at least that's level Android Oreo detected) in just 10 minutes. When connected to a power adapter (Qualcomm Quick Charge 3.0 compatible), we managed to fully charge the earphones in under 30 minutes, which is quite impressive. The only way to check the battery level of the earphones is to see the LED light or through your phone, as there's no voice prompts for this. You also don't get any audible cues when the battery running low, other than the flashing red LED light on the neckband. For a debut wireless earphone, the OnePlus Bullets is a very good attempt and something that will complement your OnePlus smartphone nicely. At Rs. 3,990, OnePlus is selling them at a slightly lower price than what it's selling for in the US ($69), which makes them good value. It's well built, has a weather resistant design, and sound great when used with an aptX compatible phone, although the highs sound a bit sharp at higher volumes. We would have liked to see NFC and maybe a vibration motor for incoming call alerts, but perhaps that's asking for too much at this price. product OnePlus Bullets Wireless offer very good audio performance at a very approachable price. Read our review to find out more.